Every piece in the Still Life Collection begins as a real leaf! 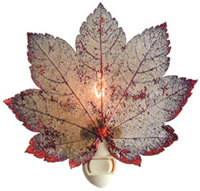 Some of the leaves are made semi-transparent through an intricate filigree process, and others are left solid. Some styles are individually dipped in 24 karat gold, silver or iridescent copper.